AMANDA SUCCESSFULLY PORTRAYS A REAL SENSE OF THE GRACEFUL MOTION OF FISH THROUGH WATER. 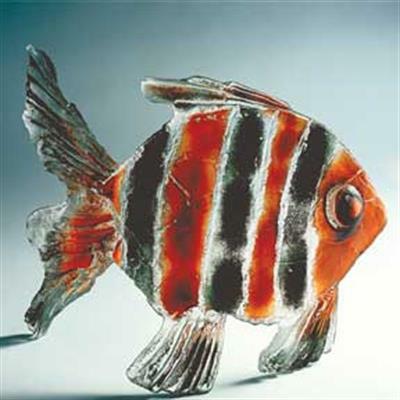 ORIGINALLY INSPIRED BY THE CARIBBEAN, HER FISH SCULPTURES HAVE A UNIVERSAL APPEAL; THEIR FANNED TAILS AND FINS ARE FULL OF LIFE AND EACH FISH EMBODIES A DISTINCT CHARACTER. USING A WONDERFULLY VIBRANT PALETTE OF COLOURS THAT EVOKE THE VARIETY OF LIFE ON THE CORAL REEF, AMANDA TRANSPORTS US TO AN EXOTIC, AQUATIC WORLD WHERE THESE BEAUTIFUL CREATURES APPEAR TO BE WEIGHTLESS.